I love succulents so adding them to my fall decor seemed like a great idea. 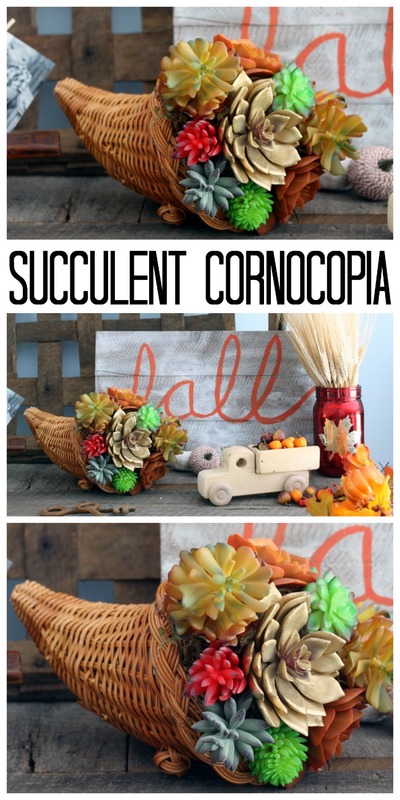 This succulent cornucopia is easy to make and will look gorgeous in your fall decor. Imagine this as a centerpiece for your Thanksgiving table. Get your supplies and make a succulent cornucopia just like this one. Links below may be affiliate links which means that you do not pay anymore but a portion of your purchase will go to support this site. 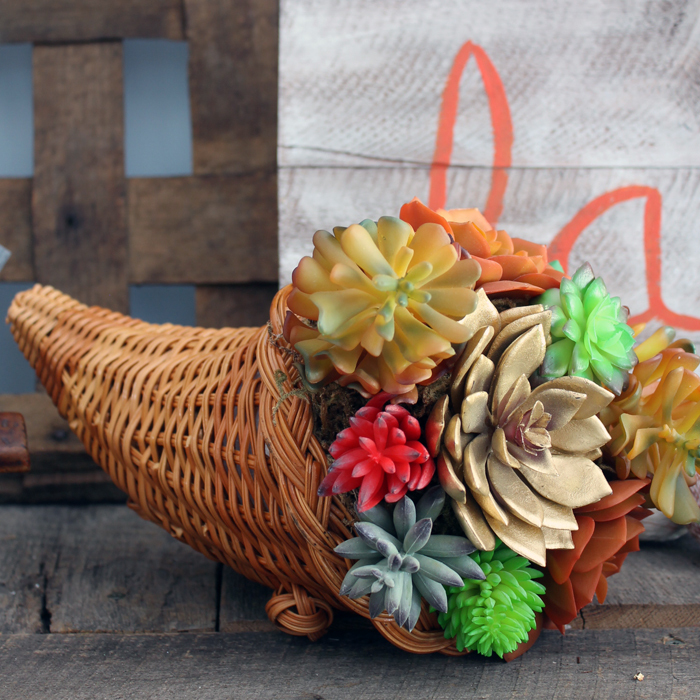 Watch the super quick video below to see how I made this succulent cornucopia for my fall decor. You can see just how easy this project is! Add moss to styrofoam ball with hot glue. Cover completely. Trim wires from succulents if needed. Add succulents by pushing them into styrofoam ball. I added my version to my fall mantel. You can use this one anywhere in your fall decor. I love succulents and this is the perfect way to use them to decorate for fall or Thanksgiving. I chose some orange and gold colored succulents in my version but you can pick any that you love. Make your own succulent cornucopia for your decor this year. 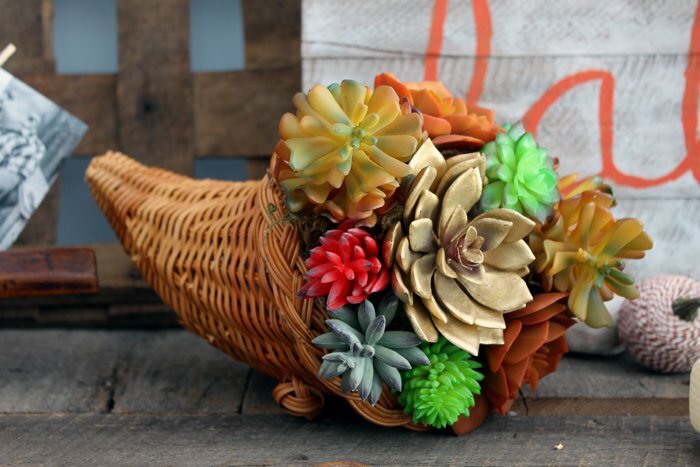 This succulent cornucopia is going to make a great addition to your fall decor. I love mine and will be using it year after year. Succulents and fall can go together perfectly! Beautiful centerpiece — I love decorating with succulents year round! Thank you for including the Fall Succulent Wreath from CraftsnCoffee.com. xo! OH wow!! I would love to make this! How fun! So I’m kind of kicking myself now for not buying that cornucopia basket at the thrift store the other day that my son thought i should get…should have listened to him. This is gorgeous! I have overlooked them for years! Then it hit me….succulents! Thanks Karen! This is such a gorgeous idea! I love succulents but have never known how to decorate for Thanksgiving so this works great for me, thanks! This turned out so adorable! I love finding succulents in unexpected places like pumpkins and cornucopias! Beautiful! 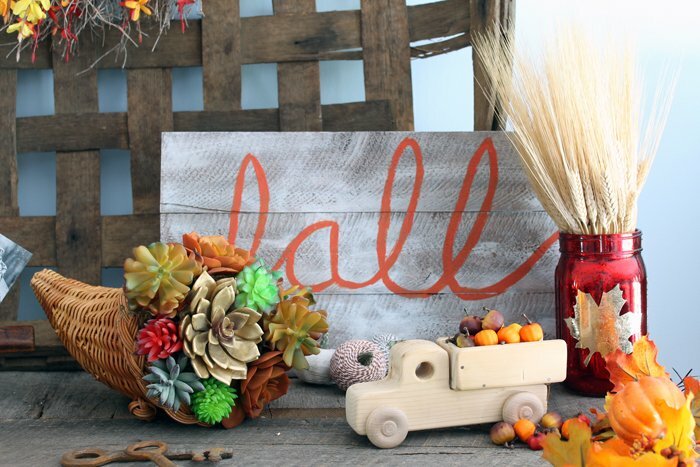 I am a huge fan of succulents but never thought to use them in my Fall decor. Great idea.